We have a range of sizes available at reasonable monthly rates. All of our units have wide aisles and drive-up doors. We have locks available for purchase in the office. 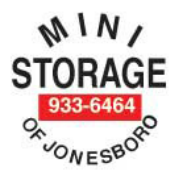 As payment, Mini Storage of Jonesboro takes checks, cash and major credit cards. Wondering what size unit you will need? Here are some suggestions. A 5 x 10 unit contains 50 square feet of space. This would compare to a large walk-in closet. This size unit could store items from a studio or small one bedroom apartment, or about 70 file boxes with walk-in allowance. A 10 x 10 unit contains 100 square feet of space, and this would compare to the space in a small bedroom. This would store roughly the furnishings from a one bedroom apartment or 200 file boxes with walk-in allowance. A 10 x 15 unit contains 150 square feet of space which compares to the space in a large bedroom. This size unit can store the furnishings from a two bedroom apartment or 300 file boxes with walk-in allowance. A 10 x 20 unit contains 200 square feet of space which is comparable to a one car garage. This unit area can store furnishing from a three bedroom home, a car or pickup, or 370 boxes with walk-in allowance. A 10 x 25 unit is 275 square feet of space and compares to a one car garage. This size unit can store furnishings from a three or four bedroom home, a car or pickup, or could serve as a mini warehouse for building materials and equipment. These estimates are approximate and will vary according to the size of your individual belongings.